Bella Napoli is a classic neighborhood Italian in Shrewsbury, serving up a taste of la dolce vita. Shrewsbury is dotted with Italian restaurants, many of which are part of popular chains, so there is stiff competition for those wanting to set up their own independent Italian. 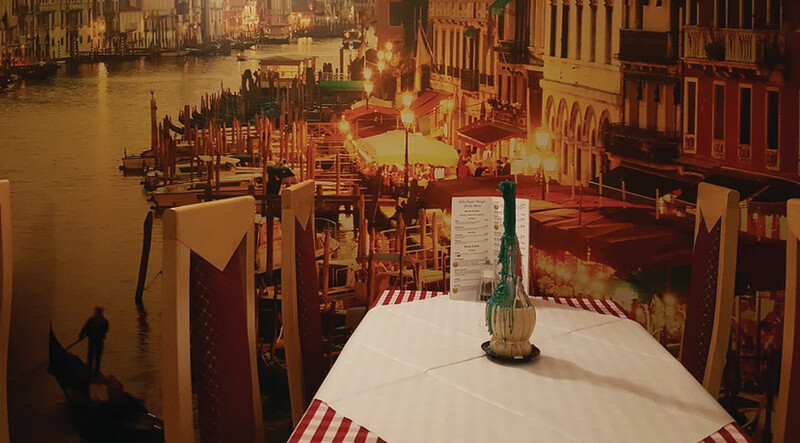 We were invited to dine at Bella Napoli, a small family-run establishment in the town’s Castle Street. I can assure you that their food and service offer a dining experience far superior to anything provided by any of Shrewsbury’s Italian chains. Firstly, I wish to mention the impeccable service you receive at Bella Napoli. Upon our arrival, we were greeted with warm, welcoming words and broad smiles. The staff were attentive throughout the meal, but without being overly present at the table. It became clear that the restaurant had regulars - a good sign. One couple entered and proceeded to share in-jokes with the owner and other members of staff; another indicator of the restaurant’s friendly, open nature. However, I do think sprucing up the decor downstairs would help the staff encourage more people in off the street to give the restaurant a go. Bella Napoli is a wonderful, intimate size, and I believe some slight remodelling would truly do it justice. People say not to judge a book by its cover, but when it comes to choosing a restaurant, people certainly do! However, I was excited to see that you can observe the chefs crafting your meal from your table, which is a feature I love. So, overall, first impressions were promising - and the food that followed certainly didn’t disappoint. Bella Napoli’s menu has everything you could ask for. A wide range of dishes are offered that can suit any pocket and palate: from Italian classics like bruschetta, lasagne and homemade hand-stretched pizzas, to a range of delicious seafood and meats. The menu also caters well for vegetarians and diners on gluten-free diets, with the staff always on hand to help with your decision-making if you have certain dietary requirements. The chefs are Italian and cook all courses from traditional or original recipes, to make for truly scrumptious dishes. Bella Napoli is also open for lunch, breakfast and mid-morning coffee with homemade cake, so you can step inside to sample their food and hospitality most hours of the day. To complement my meal, I had a gloriously delicate white wine from the Italian wine list. There isn’t a great deal of choice, but the wine seemed of very good quality and of reasonable price per glass. My companion chose a simple beer. For our starters, we opted for Calamari Fritti with lemon and aioli and Capesante in Cappotio - scallops wrapped in pancetta with a garlic butter sauce. Scallops are notoriously difficult to cook perfectly, but the chef at Bella Napoli managed it. They were divine, soft morsels, and the pancetta wrapping was thin enough to ensure it didn’t overpower the delicate flavour of the scallops - a top-notch starter. The calamari was also cooked well and avoided being too chewy, which is always a relief. It could’ve done with a little extra flour coating to really give it that crisp texture, as it was a little patchy in places; but again, the balance of flavours on the plate was lovely. Our fantastic dining experience continued with the main courses. We had Risotto Pollo e Spinach and a fillet steak with the chef-special peppered sauce, rosemary potatoes and French beans. We were delighted by the quality of ingredients and the extremely high standard of execution, as well as the generous portion sizes. My risotto was creamy but not too rich; it felt indulgent and comforting without being too stodgy. The flavour given by the chicken and spinach combination was soft, delicate and gently seasoned. I adored this because I’ve sometimes been disappointed by the obvious saltiness of risottos in other restaurants. The true show-stopper, however, was my partner’s fillet steak. This was a truly glorious piece of meat of the highest possible quality (I want to know who their supplier is!) and was cooked to absolute perfection. It was so lusciously tender that the knife glided through it no problem at all. The sauce and its accompaniments married together this wonderful dish. We decided to indulge in dessert (of course! ), but one to share, as I was quite full from previous courses. As soon as we spied lemon cheesecake on the menu, it was a no-brainer - cheesecake is a real winner with us, if done well. We weren’t disappointed. The perfect balance of light and creamy, it was delightfully offset by the sharp lemon topping. Our first experience of Bella Napoli was a very pleasing one. Although some slight improvements could be made, both in terms of the restaurant’s appearance and the execution of some of the simpler dishes, the food in most cases wasn’t too far short of sensational. This was topped off by the first-class service. I look forward to returning to sample some of the other dishes on offer, in the hope that they’re just as delicious.